Paco Díaz (Palma de Mallorca, Spain) on 19 June 2010 in Art & Design. Une très belle oeuvre que j'ai déjà vue plusieurs fois en photo mais qui me charme chaque fois, d'autant que les choix de cadrages sont différents. Bon w-e Paco ! Wow!!! splendide cette oeuvre d'art, superbe cadrage. Bonne journée. Excellente et impressionnante vue en plongée! Superbe image!!! Holy Macaroni and there's a spider hugger, ah you gotta wonder, this is fabuluos, mon ami, bravo!!! good shadow/highlight work bringing out the dynamic range. The pov is perfect for showing the size of the sculpture. Execelente!!!!!! desde el que admira estupefacto el cuerpo de la araña, hasta los que la desafían pasando por debajo de sus patas!!!! !Buen fin de semana! brrrr.... pas le genre de petite bête qui m'inspire , je n'aimerais pas trop passer dessous ! Sublime, j'adore la composition !! Peace ! La linea de la derecha es tan perfecta que parece imposible. Muy buena la visión desde arriba para esta foto! Oddly enough I had an encounter with a spider in the shower this morning...not a cool one like this though! Wonderful image with great contrast an colors. You really capture the dimension of the sculpture by seeing the people around it. Excellent! Attack of the killer spider! Great perspective, nicely done. War of the Worlds! Run, Paco! This is a wonderful shot with those tiny people and great POV. 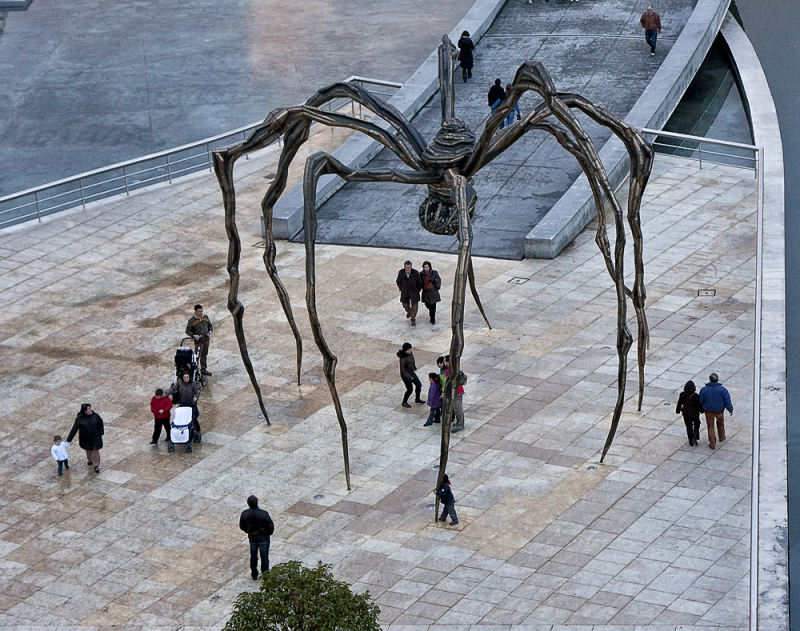 We had three of these spiders along the Embarcadero - not far from where I am sitting. They were not nearly so large as this one but were clearly from the same artist. I am not sure if they might still be there. This image is really excellent. You managed getting it from a splendid angle - and the position of all of these people are perfect. They add much to the feel of the scene. Amazing shot at this awesome statue that I spotted earlier.People almost silhouetted. So cool Paco! Well...we have in Tokyo an identical Mama located at Ark Hills, a new mall in Roppongi district, just below the Mori Tower (famous for its observatory and Museum of Modern Art, just on top of the tower). In your case it looks at ease; in Tokyo...it looks crushed in by buildings and people.